Aspen Foods, a company, based in Chicago, Illinois and owned by Koch Poultry Company, is being forced to recall 2 million pounds of chicken products after three illnesses in Minnesota were reported. The U.S. Department of Agriculture made the announcement on Thursday, July 16, 2015, and released a statement reporting that although the products consumed by the persons who became ill are stuffed breaded and appeared to be cooked, they are raw. Illness ensued even after patients properly followed the cooking instructions. The illnesses have been associated with Antioch Farms Cordon Bleu products, as stated by epidemiologist Carlota Medus, who works with the Minnesota Department of Health. The products under recall were shipped nationwide and can be recognized by their establishment number “P-1358” and were produced sometime between April 15, 2015, and July 10, 2015. Their “best if used by dates” are between July 14, 2016, and October 10, 2016. 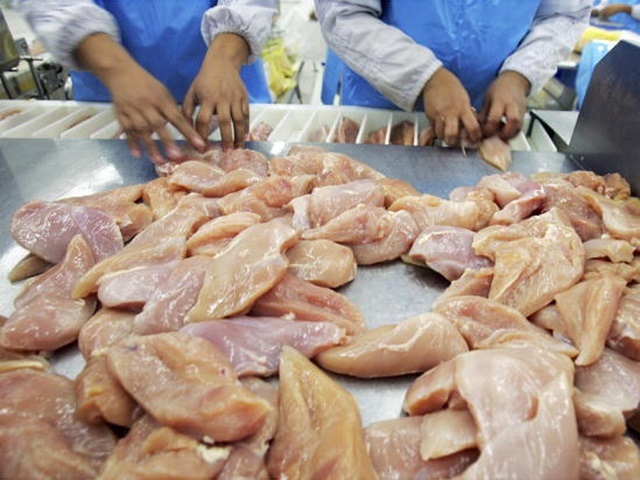 The USDA began investigating a few salmonella illnesses in Minnesota just last month; three illnesses in May and June were discovered to have been linked to recalled chicken. For questions and concerns, consumers may contact the company directly at (844)-277-6802. Another recall was issued on Thursday by Murry’s Inc., who recalled 20,000 pounds of their product, “Bell & Evans Gluten Free Breaded Chicken Breast Nuggets”. The product tested positive for Staphylococcal enterotoxin and had a “Best By” date of March 25, 2016. If you want to know whether or not a product has recently been recalled, the USDA suggests you visit askkaren.gov or call the UDDA Meat and Poultry Hotline at 1-888-674-6854.